Soft-texture T-shirt that maintains breathability. GP-604 Series uses a dedicated textile pigment (TP) ink. A softer finish which differs from thermal-transfer or silk-screen printing can be obtained. TP Ink is safe and contains very low levels of formaldehyde. It does not impair air permeability or the water-absorbing properties of fabrics. Printed fabric keeps a very pleasant feel. Because of a special binder, only heating after printing can complete the job. *Color fastness to washing differs according to the garment materials, etc.Please confirm the color fastness yourself by washing finished garments. *Printed fabrics contain very low levels of folmaldehyde, please don't use it for baby goods. High-speed data transmission increases the work efficiency. 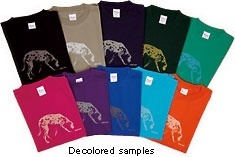 To produce vibrant color, T-shirts or garments are heated before and during printing. High-speed and quality printing is simultaneously delivered with two print heads (180 dpi x 2) per color. Two ink sets (CMYK) can be installed at once. Backlight LCD control panel clearly displays print settings/conditions. Dramatically increase your profitability through the use of on-demand production techniques. GP-604 Series uses non-screen and digital printing techniques which enable a designer to create samples and to support small lot production. Due to on-demand production workflow, redundant stocks are not necessary. In addition, screen storage space is not required because of non-screen techniques. Simply resize designs to match any T-shirt size. The print area is freely determined by the user. You can neatly print on garments, collars, and sleeves, which aren't available by silk screen techniques. Direct inkjet printing enables printing on seam lines of garments. The maximum print resolutions up to 720 x 720 dpi. Wide print area, 420mm x 610mm. For avoiding head strike, the head gap is automatically adjusted by detecting the thickness of fabric. An organically-dyed T-shirt can be bleached by chemicals. For the first time a newly developed discharge liquid supports ink-jet printers -- this allows printing on dark color T-shirts. Gradations are also perfectly expressible, which expands characteristics of an ink-jet printer. *Discharge results depend largely on organic dyeing. Please make sure to make a test print of the garment beforehand. Print the image by using only the discharge liquid.Create a monochrome image as the original image. Print the color ink and the discharge liquid simultaneously.If a colored T-shirt is printed with only the color ink, the image does not stand out. Printing by simultaneously using the discharge liquid removes the color on the T-shirt, and the color ink obtains good color development. Save manpower, space and time. A dual role "fashionable" printer cutter. Go Fabuluos & Fast for small-lot printing.